Emergency workers in Mexico are searching for survivors after landslides killed dozens in the wake of Tropical Storm Earl. The worst-affected state was Puebla in central Mexico, where at least 28 people were killed after torrential rains set off mudslides. Puebla Governor Rafael Moreno Valle said dogs had been brought in to search for those missing. Officials said some outlying areas had not yet been reached. At least 40 people have been confirmed dead after Tropical Storm Earl moved over Mexico on Saturday. Earl had earlier hit Belize and Guatemala in Central America. 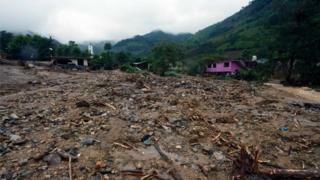 But it was in the Mexican states of Puebla, Veracruz and Hidalgo where its heavy rains caused most damage. Among those killed in Puebla were 15 children who died when their homes were buried by mud which slid down the rain-soaked hills. A whole hill collapsed near Huauchinango, sweeping down on a nearby village. "It is a tragedy what has happened to our people in Huauchinango," Mayor Gabriel Alvarado said. About two hundred people were left homeless in the state of Puebla alone. In neighbouring Veracruz, 11 people were killed and in Hidalgo a 15-year-old died in hospital after being pulled from the mud. More than 10,000 people were affected and 18 villages remained cut off in the eastern state. The US National Hurricane Center (NHC) has warned of another storm approaching Mexico. Media captionThe storm fuelled by the remnants of Hurricane Earl, is churning across the Pacific tracking towards Mexico. Ben Rich has the latest forecast for the region. It said Tropical Storm Javier could strengthen into a hurricane by Monday afternoon local time. "On the forecast track, the centre of the tropical cyclone should pass near or over the southwest coast of Mexico later today, and approach the southern portion of Baja California peninsula on Monday," the NHC said.